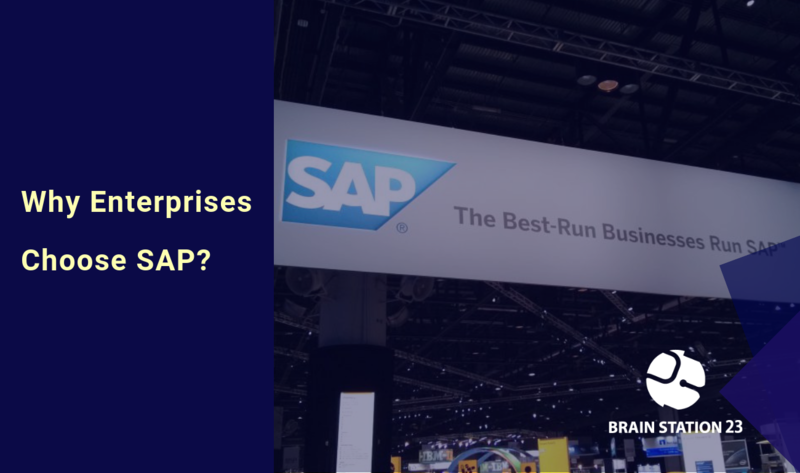 Why Enterprise Businesses Choose SAP? We all know that SAP was founded by 5 German entrepreneurs who developed a standard application software for real-time data processing. With time SAP got robust in terms of technology. SAP has been with mid-level & enterprise businesses of all industry verticals and has been helping those companies to run better in the long run since inception. All these companies have been using SAP for their daily operations and business monitoring. SAP ERP systems, therefore, is an integrated synchronized system for businesses which allows a nonstop business communication. Also, processes and removes data discrepancies between the subsystems. Hence, for systems to be modern and extremely efficient SAP is a must. So why enterprises choose SAP in the first place? Well in a sentence businesses can get an all-inclusive set of integrated, cross-functional dealing processes which is why SAP is so popular among enterprises. But let me discuss some more pointers why SAP is becoming popular among mid-level companies as well. Enhanced insights and output for easier operation management etc. Scale up in an efficient way: Rather than introducing new processes and more process variants for any growing organization. It’s always preferable for them to simplify & rationalize the number of processes and process variants and on making those processes more straightforward. Therefore with SAP’s standard ERP system business transformation becomes easier which will also ensure a better result. Increase customer service quality and build intimacy with customers: Nowadays in a business environment partner communication and collaboration is the number one priority. Thus to build the capabilities to keep the partners informed and well engaged would be the best way to keep them happy and committed. SAP helps businesses to increase customer service quality and intimacy in an effective way. Consolidate the information and to make the better decision: SAP will help businesses to consolidate various silos of data and information and will reduce errors which occurs for manual work and will help avoid redundancy and duplication. And it will thus create a framework for efficient and effective decision making. Additionally, It will make the story which will motivate the stakeholders through the tough journey ahead. Today let me share an interesting case study of our SAP expert. It’s on his previous experience on implementing SAP for a globally reputed logistic & supply chain company. A well reputed global logistic & supply chain company. As the company grew, it got to the point where the legacy systems were no longer providing the necessary visibility to effectively run their business. Too many different systems were used to manage the various processes, and these systems were not integrated with each other. This led to contradicting data sets, and inaccuracies in reporting, customer de-satisfaction, financial statements, as well as controlling and profitability analysis malfunction. The client evaluated several ERP platforms. Due to the vast amount of integration between the various modules, and the need for flexibility of the system because of their complex business process, they decided to proceed with SAP. The main challenge was to transform the existing business process into SAP as client’s one big requirement was to keep similar work process as they were habituated with their legacy system. Another big challenge was management reporting which was really complex. Implementation team took these challenges seriously and successfully overcame by deeply understanding existing business process and exploring SAP insight for mapping the blueprint into SAP as well leveraging a large number of customization for reporting purpose. Determine client side department heads, and subject matter experts (SMEs). Kick off meeting with all department heads, and SMEs. Review of the implementation process, and timeline. Discuss deliverables for the various stage in the implementation. Web-enabled online order booking system integrated with SAP. By using a team of skilled SAP consultants with cross-functional experience in multiple modules, we were able to deliver a high-quality implementation with minimal post-Go-Live troubleshooting. Given the vast amount of integration, it was important to have experienced consultants who understand not just their specific modules, but also how those modules integrate with other modules in SAP. Business interruption on Go-Live was minimal, and within one month, the key team members had developed a new routine in their everyday business processes. SAP consulting team soon transitioned from the implementation role into a support role. Since completion of the implementation, SAP consulting team was transitioned into after go-live supporting, daily troubleshooting and improvement efforts. Description: As an expert IT professional, Sushanta Paul has more than 18 years of experience in the IT industry which includes a decade of experience in the field of ERP(SAP) implementations. He has worked on seven SAP implementations, which includes roll-outs and support projects in Bangladesh, India and USA. His ERP implementation experience spans in the following industries; chemical and gases, pharmaceuticals, healthcare, logistics service (export and import), real estate, garments, consumer products, and food manufacturing industries. He has work experience in multiple geographies such as Asia, Europe, Africa and North American work culture. He worked for UNICEF as an independent database consultant for REOPA (Rural Employment Opportunities for Public Assets) project in Bangladesh.